If you’re a beginner photographer, this book can save you hundreds of dollars. If you’re a seasoned pro, it can save you thousands. By helping you choose the best equipment for your budget and style of photography, this book can drastically improve the quality of your pictures. In this book, award-winning author and photographer Tony Northrup explains explains what all your camera, flash, lens, and tripod features do, as well as which are worth paying for and which you can simply skip. 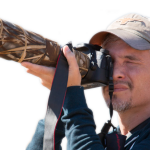 Tony provides information specific to your style of photography, whether you’re a casual photographer or you’re serious about portraits, landscapes, sports, wildlife, weddings, or even macro. What should my first camera be? Should I buy Canon, Nikon, or Sony? Is a mirrorless camera or a DSLR better for me? Do I need a full frame camera? Is it safe to buy generic lenses and flashes? What’s the best landscape photography gear? Which portrait lens and flash should I buy? What gear do I need to photograph a wedding? How can I get great wildlife shots on a budget? Which sports photography equipment should I purchase? Should I buy zooms or primes? Is image stabilization worth the extra cost? Which type of tripod should I buy? Which wireless flash system is the best for my budget? How can I save money by buying used? What kind of computer should I get for photo editing? What studio lighting equipment should I buy? Which brand of lights should I buy for studio portraits? What equipment do I need for on-location portrait shoots? When you buy this book, you’ll be able to immediately read the book online. You’ll also be able to download it in PDF, .mobi, and .epub formats–every popular format for your computer, tablet, smartphone, or eReader! When you have a specific question about something in photography (or anything else for that matter) everyone will always have an opinion. Great example are online forums where everyone will have their own opinion on something. With this book (I have the kindle version) you will get Tony’s and Chelsea’s professional (true and tried) opinion on just about any equipment you will need. The guide is very honest, doesn’t pick a side (Canon or Nikon) and even recommend some third party companies because they are the best bang for your buck. They give suggestions for people just starting out with a very small budget all the way to the pros with $$$ to spend. What I personally like about this book is the fact that it’s almost like a FAQ book where two professionals that make a living from photography answer all the questions you might have about every type equipment you can imagine for this field. Great reference book when you are ready to buy a flash. or upgrade your monitor, or go to a full size camera, or a new lens, or tripod… you get the point I think. You also become part of a very unique community where Chelsea and Tony both will answer your questions if you happen to have any. It’s almost like joining a very big family. I highly recommend ALL their books to people just getting into photography to pros looking to get new gear. Just see for yourself about the book. Take a look inside since you can do that on amazon. You will love the rest of the book. Let me also add the book is VERY easy to read. it’s not ‘dumbed’ down, but just everything is explained really well which won’t confuse a novice photographer. This is a phenomenal guide for beginning-to-intermediate DSLR photographers who are looking to start their kits or expand their current collections. It’s great both as a guide to specific purchases and as a primer for building a better understanding of photography gear. Buy this before you spend any more money on your equipment. You can avoid the hassle of doing extensive research or making big mistakes on thousand-dollar equipment with this guide. Heck, this guide will pay for itself if it can save you just one instance of shipping fees! The guide is organized to make it as easy as possible to figure out what you should buy. It starts out with a FAQ that provides quick lists of gear based on the type of photography (e.g. portrait vs. landscape) and budget. Later, it goes into full detail about equipment specifications, what they mean, and why (or if) they’re important. You could research all of this on your own, but it would take months. The guide is focused on Canon and Nikon equipment, but there’s also some information about Sony Alpha, four-thirds, and point-and-shoot equipment. If you end up liking this guide, I highly recommend Tony’s other book, Stunning Digital Photography. I had previously given this Book a 1 star rating because I was very disappointed in its usefulness in purchasing a tripod gimbal head. If you value the user reviews as much as I do then I must apologize to you as well as the author for my initial review. It was much to harsh. I am now increasing my review rating from one to four stars. That’s a giant change from my previous review.I explain that by saying that I was really premature in judging the book by a very small segment of the books content. After the fact and a comment by the author, I did a further examination of books content. I soon realized that I had made a huge error in judgement which is a big disservice to all. The book contains a much better guide to purchasing and includes many valuable buying tips than I had realized when I wrote that initial review. Had I taken the time to look further into it’s contents before I gave it such a low rating my review would have definitely given it a much better star rating. I won’t give it a 5 star rating as there are areas of the book that I feel wont be of much value for those that might be looking for purchasing guidance on some items. However those items ares a very small part of the whole book. When I first looked at this book on Amazon it seemed like a high priced book for just a paperback buying guide on cameras. I took a chance that the 5 start ratings were not just fluff reviews. I was not disappointed. This book is amazing! Worth every penny. Not just price guide but it has strategies for putting together a complete photo set up at a good price. His used camera and lens prices are spot on with ebay. I especially like the way he has all subjects set up with quick reference charts. This book is fast to reference when checking used prices online. As with Tony’s other books (Stunning Digital Photography and Lightroom 6/CC), this is a quality reference guide. The book makes some great recommendations on what gear to buy, how to buy it, and what price range to expect. It can easily save you hundreds of dollars. I was going to buy a flash unit that was 8x more expensive than the one I actually bought because of the recommendation this book made. 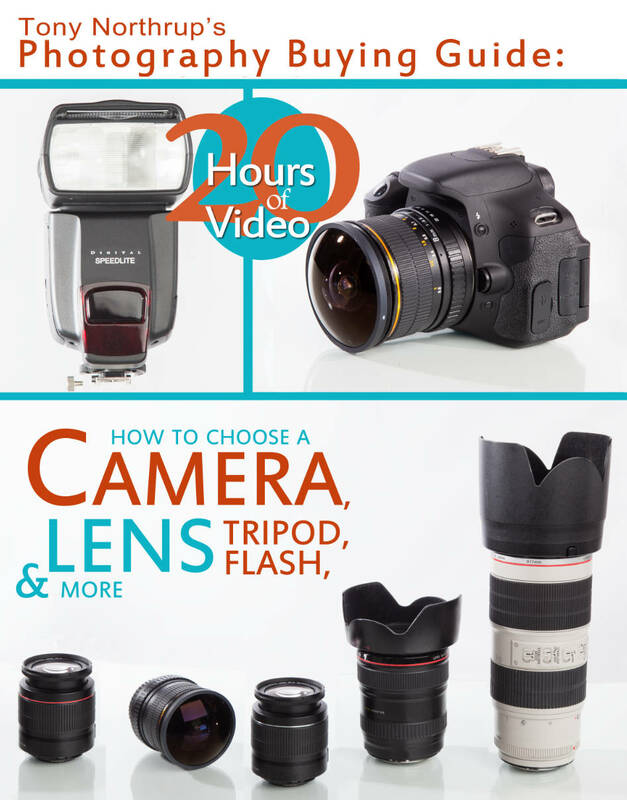 The book covers camera bodies, lenses, tripods, flash units, and more! It makes recommendations for newbies, amateurs, and professionals with budgets of all kinds. I especially recommend this book to anyone looking to start digital photography. Great information. Still reading. Arrived on time. This book is great!! I love all the videos and tutorials. The only think that I didn’t like is that pictures or videos overlap text on my iPad but that just an issue with it being a digital download I suppose. I will be reading this book again soon, as the information is awesome for a new photographer trying to get to know the differences in equipment and its uses. It’s a great resource. Easy to read & I love the videos. This book is fantastic! Without being hyperbolic it is one of the best buying guides I have seen on a subject as complex as photography. It is part buying guide/catalog, part tip guide, and part encyclopedia, and is overall very comprehensive. It is setup for both “quick hits” and “deep dives” on the various categories and product lines which is great for times when you get/have questions or anecdotes that you may want to cross reference. What ultimately sold me on buying this book (even though I already have some camera gear) is the thorough, objective approach that Tony Northrup, his wife, et al. bring to the discussion of camera equipment. Add in the [large] bonus benefit that this “book” is extensible, and is augmented with video that can expand on, showcase, or even correct/revise various subjects found within, and this book sets itself well ahead of any similar material I have encountered. I haven’t really found any major downsides so far. I will definitely recommend (I have already) this book to others, especially friends who focus [pun intended] way too much on the hype, and marketing. The only minor niggle I could come up with is that the imagery in the book is a little… low quality (course). Not really a complaint per se, as I’m sure the book would have to cost quite a bit more if it the photos were high-res and/or full color. I doubt this is any kind of issue for the electronic version, but I’m an “old fogie” (not really), who prefers to hold a book in hand that does not require battery power. Excellent book. It gave me clear guidance, which helped me to purchase my first DSLR. I love that it gave straightforward reasons for each piece of equipment and described the type of person who would most benefit from each. I ended up buying a refurbished camera that is an older model and I could not be happier. Without this book, I likely would have purchased a much more expensive first DSLR that far exceeded by current abilities. It also gives great guidance for beginners as well as advanced users. The chapters breakdown the different types of equipment and various brands of cameras and equipment. I love that Northrup gives great advice without trying to upsell his reader to his sites or services. He quotes some of his own resources, which are genuinely good, but there is so much to be gleaned from this book that does not additionally benefit the author. I really appreciate that today where so many books are really marketing and promotional materials in disguise. I will refer back to this book often as my skills improve and I require additional equipment.